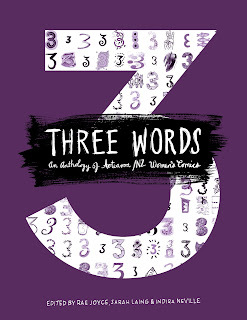 You can now pre-order your copy of Three Words: An Anthology of Aotearoa / NZ Women's Comics at a special pre-order price of $45! Estimated delivery date: 3rd of March, 2016. With comics by Adele Jackson, Alex McCrone, Alex Wild, Alice Tumblescribbleson, Alie Macpherson, Andra Jenkin, Bek Coogan, Anna Crichton, Beth Duckingmonster, Beth Sometimes, Carolyn Anderson, Celia Allison, Claire Harris, Dawn Tuffery, Demarnia Lloyd, Diane Rimmer, Elsie Jolliffe, Emma Blackett, Erin Fae, Debra Boyask, Giselle Clarkson, Indira Neville, The Rabbid, Jem Yoshioka, Jessica Dew, Jessica Hansell, Joanna Anderson, Judy Darragh, Kayla Oliver, Kerry Ann Lee, Lauren Marriott, Margaret Silverwood, Olga Krause, Linda Lew, Lisa Noble, Liz Mathews, Loux McLellan, Lucy Meyle, Maiangi Waitai, Marina Williams, Mary Tamblyn, Mengzhu Fu, Mirranda Burton, Miriam Harris, Pritika Lal, Rachel Benefield, Rachel Shearer, Rae Joyce, Raewyn Alexander, Rebecca Hawkes, Renee Jones, Rosemary McLeod, Warsaw, Sally Bollinger, Sarah Laing, Sarah Lund, Sharon Murdoch, Sophie McMillan, Sophie Oiseau, Stella Corkery, Susan Rugg, Susan Te Kahurangi King, Suzanne Claessen and Zoe Colling. And essays by Robyn Keneally, Ruth Boyask, Jem Yoshioka, Miriam Sapphira and Rae Joyce.